A UK university is re-inventing itself as a "globalised" institution - with plans for degree courses in which units are taught in different countries. The University of Surrey wants to offer degrees in which students might move each year between partner universities in three countries. This could include universities in the US, China and elsewhere in Asia. The university, planning a rapid growth in student numbers, has confirmed a deal with Dongbei University in China. The partnership with Dongbei University of Finance and Economics, in the Chinese city of Dalian, is part of a 10-year plan by the University of Surrey to become an "international institution". The partnership will create undergraduate and postgraduate courses in management, computing and entrepreneurship - with the aim of allowing Chinese students to study in Guildford and for UK students to spend part of the course at Dongbei. 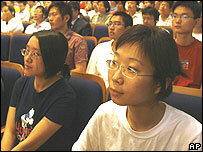 Courses in China will be taught in English and will replicate those taught at the University of Surrey. Surrey, which aims to increase student numbers by 40% in a decade, plans to set up a series of international branch institutes, including in China. Degree courses in which students will be able to switch between overseas partner universities are likely to be in subjects such as business and management and information technology, says University of Surrey vice-chancellor Christopher Snowden. Students in these subjects are keen for this type of international experience, he says, and the barriers are more likely to be about cost than any questions about academic compatibility. Globalisation has become a strong theme in higher education - with UK universities now seeing themselves as competing on an international stage. "At the moment, we are at the stage where UK universities have set up bases overseas - in the future, we'll see these universities becoming international institutions which have a headquarters in the UK," says Professor Snowden.